Background: TFIIF is a member of the group of general transcription factors that facilitate the binding of RNA polymerase II (Pol II) to promoter sequences as part of the pre-initiation complex (PIC) (1). 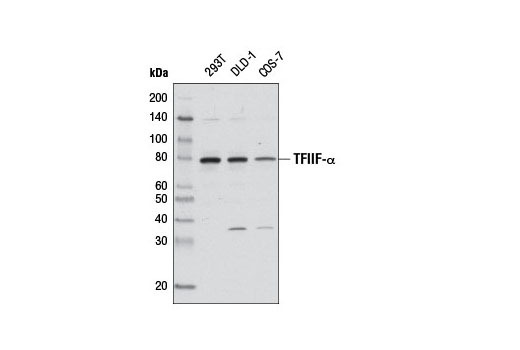 TFIIF consists of subunits TFIIF-α (RAP74) and TFIIF-β (RAP30). 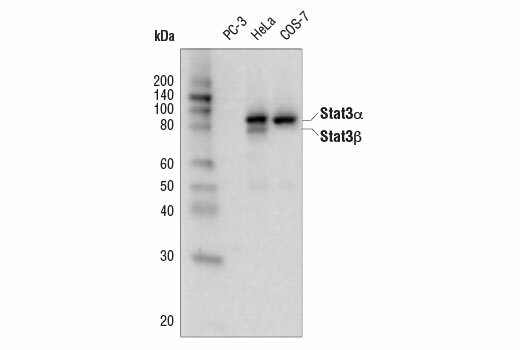 It is involved in the stabilization of Pol II association with the PIC and selection of the transcription start site during transcription initiation (1,2). In addition to its role in transcription initiation, TFIIF has been shown to stimulate the transcription elongation activity of Pol II as well as dephosphorylation and recycling of Pol II during transcription termination (3-5). 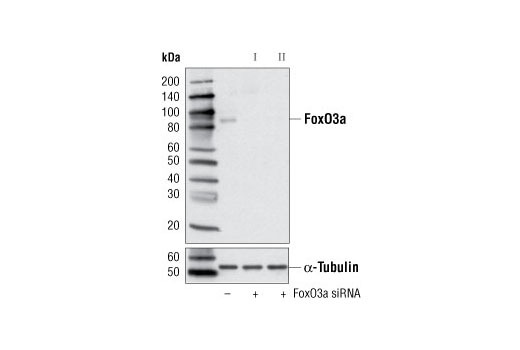 SignalSilence® FoxO3a siRNA II from Cell Signaling Technology (CST) allows the researcher to specifically inhibit FoxO3a expression using RNA interference, a method whereby gene expression can be selectively silenced through the delivery of double stranded RNA molecules into the cell. 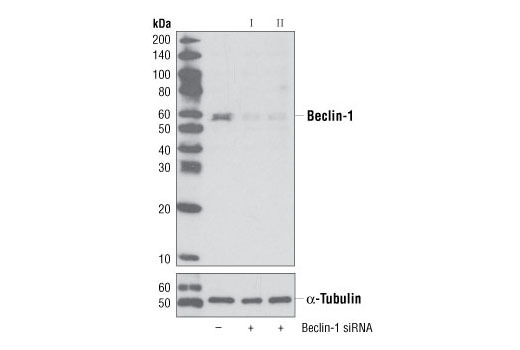 All SignalSilence® siRNA products from CST are rigorously tested in-house and have been shown to reduce target protein expression by western analysis. Background: CYP17A1, also known as cytochrome P450C17, is a steroidogenic enzyme belonging to the P450 cytochrome superfamily of monooxygenases (1, 2). In humans, CYP17A1 expression is abundantly expressed in the adrenal cortex, where it plays a central role in the androgen synthesis pathway (2). CYP17A1 is the primary target of abiraterone, a synthetic steroid used in the treatment of castration-resistant prostate cancer (CRPC) (3, 4). Abiraterone is converted to the more active form D4A, which antagonizes androgen receptor signaling by inhibiting CYP17A1 and other steroidogenic enzymes (3, 4). This suppresses the synthesis of 5α-dihydrotestosterone (DHT), which is a driver of castration-resistant prostate cancer cell growth (3, 4). 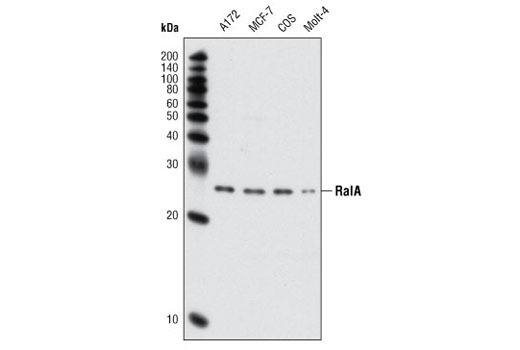 Background: Myristoylated Alanine-Rich C-Kinase Substrate (MARCKS/ MARCKS-like protein 1/ MacMARCKS/ MLP/ MRP) is a widely expressed membrane-bound PKC substrate involved in multiple cellular functions (1). 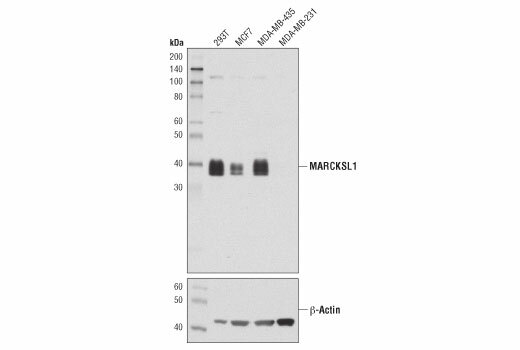 MARCKSL1 is a MARCKS homolog that also serves as a substrate for PKC, and regulates cytoskeletal dynamics, migration, adhesion, and proliferation.In response to phosphorylation by JNK, MARCKSL1 regulates migration and actin dynamics in neuronal and prostate cancer cells (2). In the developing retina, MARCKSL1 regulates cell proliferation, and its expression decreases as retinal development progresses (3). 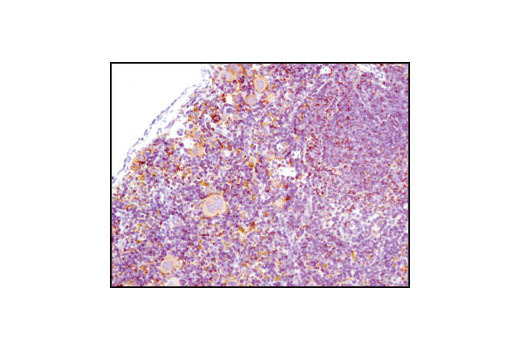 Researchers have shown that MARCKSL1 may serve as a prognostic marker in lymph node-negative breast cancer (4). 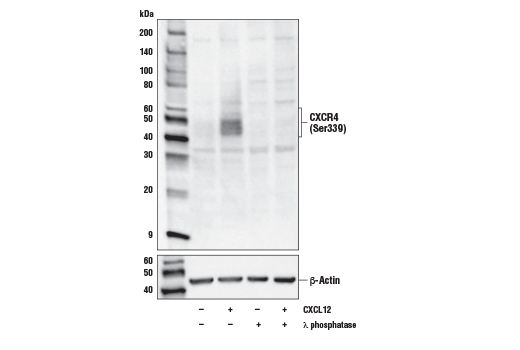 Background: CXCR4 is a chemokine receptor that belongs to the G protein-coupled receptor family. It is activated by a small cytokine, CXCL12, also known as stromal cell derived factor 1 (SDF-1) (1). The main function of CXCR4 is the mediation of the homing of progenitor cells in the bone marrow and their recruitment to sites of injury (2). More recently, CXCR4 has been studied, as a potential therapeutic target, in the context of autoimmune diseases (3) as well as cancer, as the receptor is involved in the regulation of migration, proliferation, and survival of cancer cells (4). Background: DNA topoisomerases I and II are nuclear enzymes; type II consists of two highly homologous isoforms: topoisomerase IIα and IIβ. These enzymes regulate the topology of DNA, maintain genomic integrity, and are essential for processes such as DNA replication, recombination, transcription, and chromosome segregation by allowing DNA strands to pass through each other (1). Topoisomerase I nicks and rejoins one strand of the duplex DNA, while topoisomerase II transiently breaks and closes double-stranded DNA (2). Topoisomerases are very susceptible to various stresses. Acidic pH or oxidative stress can convert topoisomerases to DNA-breaking nucleases, causing genomic instability and cell death. DNA-damaging topoisomerase targeting drugs (e.g., etoposide) also convert topoisomerases to nucleases, with the enzyme usually trapped as an intermediate that is covalently bound to the 5+ end of the cleaved DNA strand(s). Research studies have shown that this intermediate leads to genomic instability and cell death. Thus, agents that target topoisomerases are highly sought after cancer chemotherapeutic drugs (3). Ca2+-regulated phosphorylation of topoisomerase IIα at Ser1106 modulates the activity of this enzyme and its sensitivity to targeting drugs (4). Background: CD14 is a leucine-rich repeat-containing pattern recognition receptor with expression largely restricted to the monocyte/macrophage cell lineage (1). 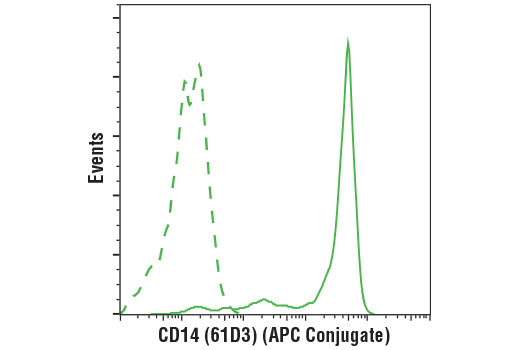 Research studies have shown that CD14 is a bacterial lipopolysaccharide (LPS) binding glycoprotein, expressed as either a GPI-linked membrane protein or a soluble plasma protein (2). LPS induces an upregulation of GPI-linked CD14 expression, which facilitates TLR4 signaling and macrophage activation in response to bacterial infection (3-5). Background: Rabex-5, also called RabGEF1 and RAP1, was identified as a guanine nucleotide exchange factor (GEF) for Rab5, a member of the Ras superfamily of small Rab GTPases (1). 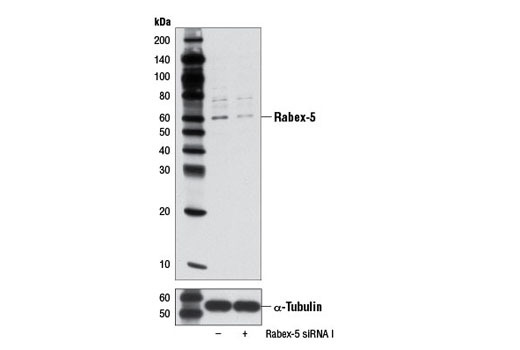 Rabex-5 generates the GTP-bound active form of Rab5 and forms a tight association with its effector protein Rabaptin-5 (2). This complex localizes to endosomal membranes where it functions as a key regulator of vesicular trafficking during early endocytosis (3,4). 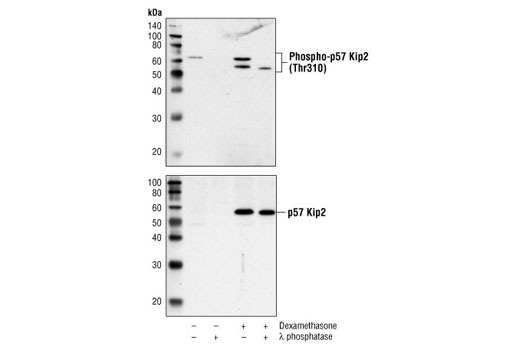 Rabex-5 is also monoubiquitinated and has ubiquitin ligase activity that regulates its recruitment to early endosomes (5,6). The conformational change between Rab5 GTP/GDP states is essential for its biological function as a rate limiting regulator at multiple steps during endocytosis (5). 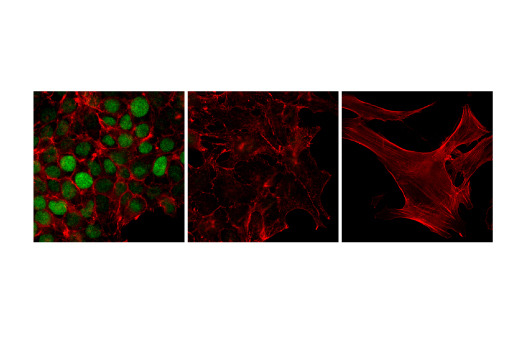 Through its control of endosomal trafficking and endocytosis, Rabex-5 has been shown to negatively regulate NGF-mediated neurite outgrowth (7) as well as FcεRI-dependent mast cell activation (8). Background: Cullins are proteins that function as molecular scaffolds for modular ubiquitin ligases typified by the SCF (Skp1-CUL1-F-box) complex (1-3). The substrate selectivity of these E3 ligases is dictated by a specificity module that binds cullins. 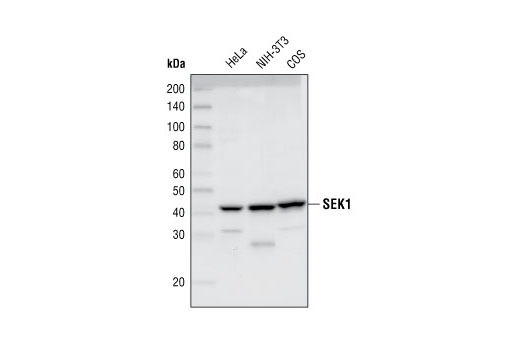 In the SCF complex, this module is composed of Skp1, which binds directly to CUL1, and a member of the F-box family of proteins such as Skp2 (1-4). CUL3 has been shown to be required for embryonic development in mammals and Caenorhabditis elegans (5-7) but until recently, its substrate specificity adaptor had yet to be elucidated. It is now recognized that substrate adaptors for CUL3-based ubiquitin ligase complexes contain a conserved BTB/POZ (Pox virus and Zinc finger) domain. This domain, which was initially identified in the Drosophila transcriptional repressors broad complex, tramtrack, and bric-a-brac is present in more than 190 human proteins. BTB proteins contain a variety of putative protein-protein interaction domains, including MATH domains, zinc finger repeats, and kelch repeats (8).There are several lines of evidence suggesting that Kelch-like 12 protein (KLHL12) is a substrate-specific adaptor for the CUL3-based ubiquitin ligase complex. Analysis of the amino acid sequence of KLHL12 reveals an amino-terminal BTB motif, a central linker region, and a carboxy-terminal kelch domain composed of kelch repeats. 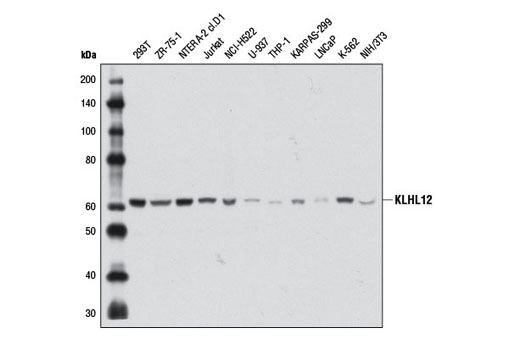 Furthermore, KLHL12 has been shown to negatively regulate Wnt signaling by binding Disheveled and targeting it for ubiquitin-dependent proteasomal degradation (9). More recently, KLHL12 was shown to drive the assembly of large COPII vesicles by promoting the monoubiquitination of the COPII component Sec31. 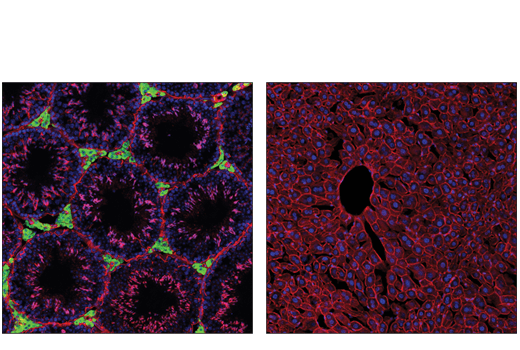 As a result, CUL3-KLHL12-dependent ubiquitination is essential for collagen export, a step that is required for integrin-dependent mouse embryonic stem cell division (10). 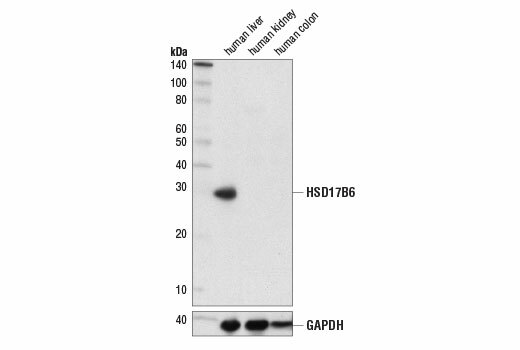 This Cell Signaling Technology antibody is conjugated to Alexa Fluor® 555 fluorescent dye and tested in-house for immunofluorescent analysis in human cells. 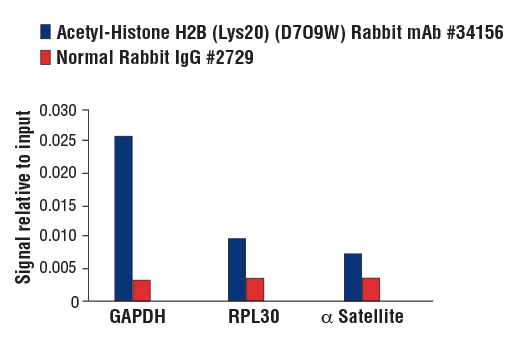 The antibody is expected to exhibit the same species cross-reactivity as the unconjugated PD-L1 (Extracellular Domain Specific) (D8T4X) Rabbit mAb #86744. 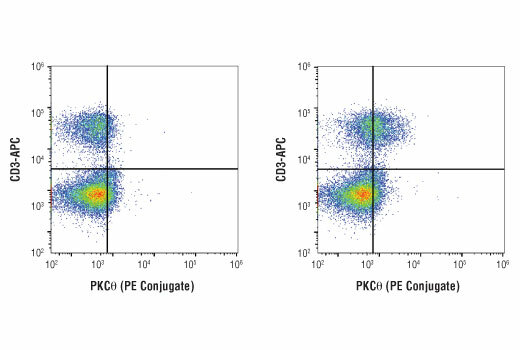 This Cell Signaling Technology antibody is conjugated to phycoerythrin (PE) and tested in-house for direct flow cytometry analysis in mouse cells. 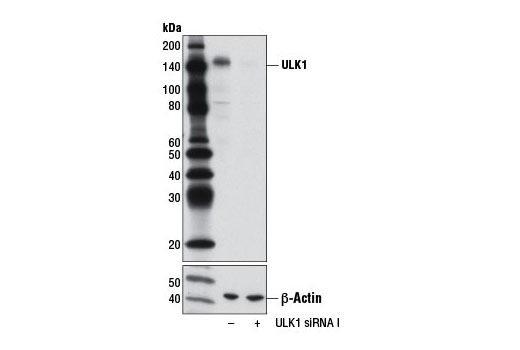 This antibody is expected to exhibit the same species cross-reactivity as the unconjugated PKCθ (E1I7Y) Rabbit mAb #13643. 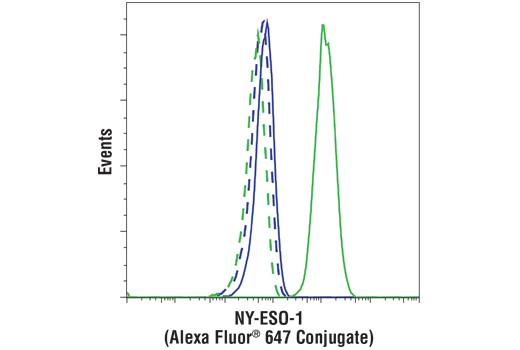 This Cell Signaling Technology antibody is conjugated to Alexa Fluor® 647 fluorescent dye and tested in-house for direct flow cytometric analysis in human cells. 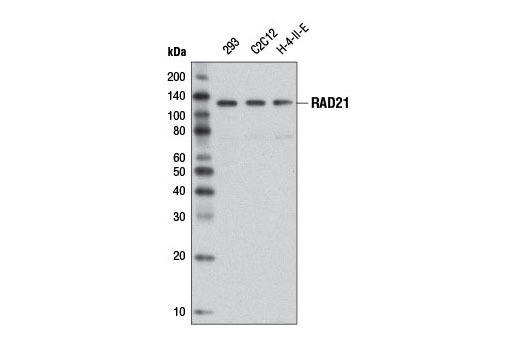 This antibody is expected to exhibit the same species cross-reactivity as the unconjugated NY-ESO-1 (D1Q2U) Rabbit mAb #45437. Background: Cancer/testis antigens (CTAs) are a family of more than 100 proteins whose normal expression is largely restricted to immune privileged germ cells of the testis, ovary, and trophoblast cells of the placenta. Although most normal somatic tissues are void of CTA expression, due to epigenetic silencing of gene expression, their expression is upregulated in a wide variety of human solid and liquid tumors (1,2). As such, CTAs have garnered much attention as attractive targets for a variety of immunotherapy-based approaches to selectively attack tumors (3). Background: RalA and RalB are members of the Ras family of small GTPases and are highly homologous in protein sequence. The functions of RalA and RalB are distinct yet overlapping. By binding to various effector proteins, RalA and RalB serve as important GTP sensors for exocytosis and membrane trafficking (1-3). RalA is required for Ras-related tumorigenesis (4) and RalB is important for tumor survival (5). In addition to tumor formation, Ral proteins also play a role in cancer cell migration and metastatic tumor invasion (6,7). Background: Structural maintenance of chromosomes 1 (SMC1) protein is a chromosomal protein member of the cohesin complex that enables sister chromatid cohesion and plays a role in DNA repair (1,2). ATM/NBS1-dependent phosphorylation of SMC1 occurs at Ser957 and Ser966 in response to ionizing radiation (IR) as part of the intra-S-phase DNA damage checkpoint (3). SMC1 phosphorylation is ATM-independent in cells subjected to other forms of DNA damage, including UV light and hydroxyurea treatment (4). While phosphorylation of SMC1 is required for activation of the IR-induced intra-S-phase checkpoint, the precise mechanism is not well understood and may involve a conformational change that affects SMC1-SMC3 interaction (3). 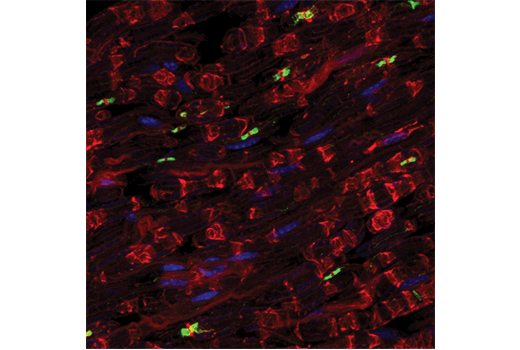 Background: Contactin-associated protein 1 (Caspr) is a membrane protein that is an essential component of the paranodal junctions in the peripheral and central nervous systems (PNS and CNS, respectively). Caspr is part of the Neurexin family of proteins and is also known as Neurexin IV, Paranodin, and Cntnap1. Caspr forms a complex, via its extracellular domain, with contactin at paranodal junctions of the axon (1, 2). Paranodal junctions are specialized junctions in the axon that are formed between the axolemma and the paranodal loops of myelinating glia. Paranodal structures are critical for salutatory conduction in the PNS and CNS. In the absence of Caspr, Caspr knockout mice exhibit mislocalization of other paranodal junction proteins, including contactin and neurofascin (3). Knockout mice also exhibit reduced nerve conduction velocities, as well as behavior defects consistent with abnormal nerve conduction. Therefore, Caspr is a critical component of a protein complex that is likely central to paranodal junction formation and maintenance. Background: SAPK/Erk kinase (SEK1), also known as MKK4 or Jun kinase kinase (JNKK), activates the MAP kinase homologues SAPK and JNK in response to various cellular stresses and inflammatory cytokines (1-3). 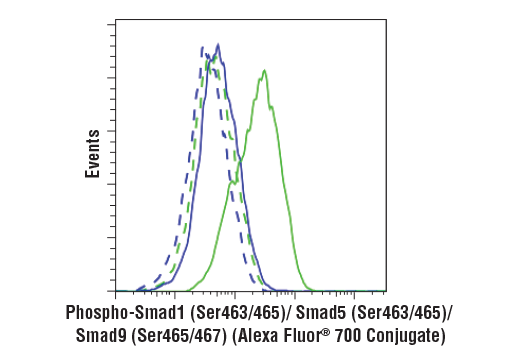 Activation of SEK1 occurs through MEKK phosphorylation of serine and threonine residues at positions 257 and 261, respectively. Like MEK, SEK is a dual-specificity protein kinase that phosphorylates SAPK/JNK at a conserved T*PY* site in its activation loop (4). 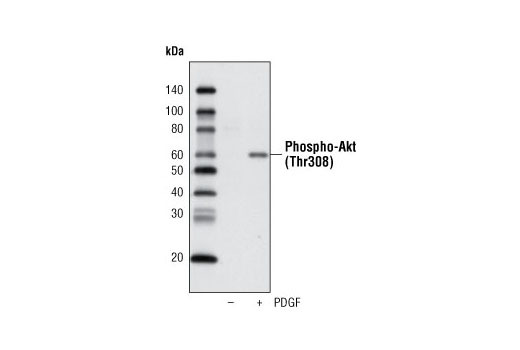 Phosphorylation by Akt at Ser80 inhibits SEK1 and suppresses stress-activated signal transduction (5). Background: B cell linker protein (BLNK), also known as SLP-65 or BASH, is an adaptor molecule that plays key roles in B cell activation and B cell antigen receptor (BCR) engagement. 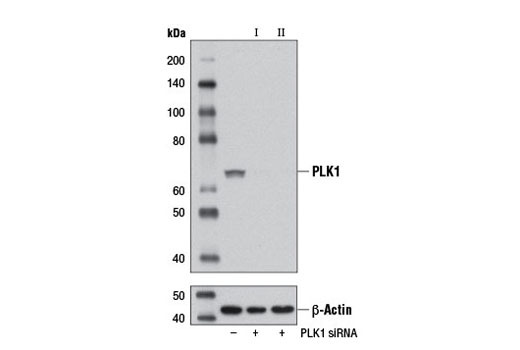 BLNK acts at the interface between BCR-associated Syk and downstream signaling cascades (1,2). BLNK has multiple SH2 binding motifs (YXXP) at its amino terminus and an SH2 domain at its carboxy terminus. After BCR ligation, BLNK is phosphorylated by Syk at multiple YXXP motifs including Tyr72, Tyr84, Tyr96, and Tyr178 (1). These phosphorylated motifs provide docking sites for signaling molecules, such as BTK, PLCγ, and Vav. These signaling molecules bind to BLNK through their SH2 domains and together activate downstream signaling pathways (3,4). 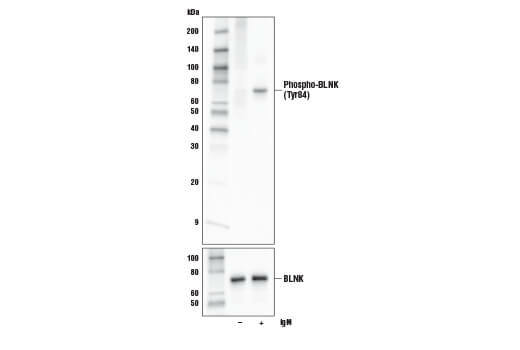 Through its SH2 domain, BLNK can also interact with tyrosine-phosphorylated targets, such as HPK1, thereby recruiting them to the BCR complex for signaling (5). Background: E2A is a member of the E-protein family of transcription factors, a subclass of basic helix-loop-helix (bHLH) proteins that bind specifically to E-box consensus sequences (1,2). Alternative splicing generates two E2A isoforms (E47 and E12) that are actively involved in B cell lineage commitment, B cell maturation, IgK V-J rearrangement, peripheral B cell development, and tumor suppression (3). 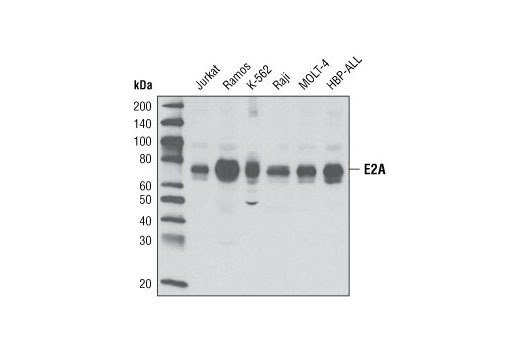 E2A acts in cis during G1 to promote immunoglobulin gene diversification (4). Research studies have shown that chromosomal translocations involving the E2A gene result in the expression of multiple fusion proteins and are associated with many cases of pediatric acute lymphoblastic leukemia (5). Background: The ADAM (A Disintegrin and A Metalloprotease) family of multidomain membrane proteins influences cell signaling and adhesion by shedding cell surface proteins such as cytokines and growth factors, by influencing cell adhesion to the extracellular matrix (ECM), and by directly remodeling the ECM. Conserved domains in ADAM family members include a prodomain, a zinc-dependent metalloprotease domain, a disintegrin domain, a cysteine-rich domain, an EGF-like sequence, and a short cytoplasmic tail (1,2).The prodomain is thought to aid in protein folding. Disintegrin and cysteine-rich domains mediate adhesion, at least in part, through binding to integrins. Phosphorylation of the cytoplasmic tail as well as its interaction with other signaling proteins may influence intra- and extracellular signaling (1). ADAM9 is widely distributed and has been shown to affect migration in skin keratinocytes (3,4). 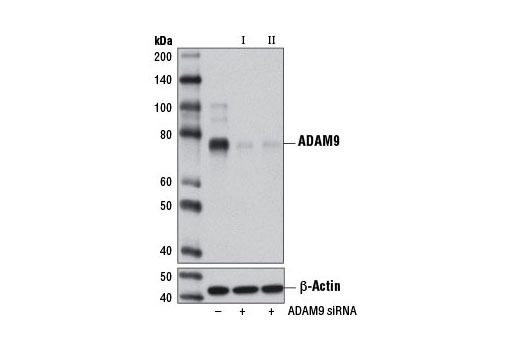 Research studies have shown that ADAM9 is overexpressed in prostate cancer (5), pancreatic cancer (6), gastric cancer (7), and has been linked to invasion and metastasis in small cell lung cancer (8). 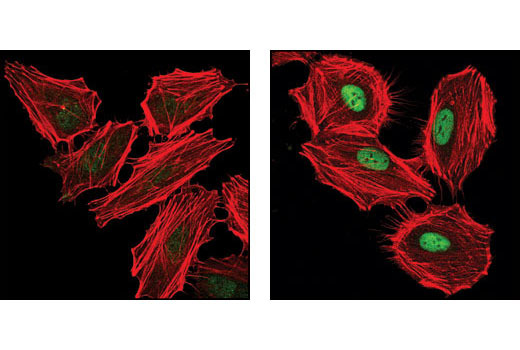 Research has also shown that an alternatively spliced short (50 kDa) form of ADAM9 containing protease activity is involved in tumor cell invasion (9). Background: The type 6 17-β-hydroxysteroid dehydrogenase (HSD17B6, 17-β-HSD 6) regulates cellular hydroxysteroids by catalyzing the conversion of androsterone to epiandrosterone (1). This enzyme displays both oxidoreductase and epimerase activities, and is also known as 3(α->β)-hydroxysteroid epimerase. The interaction between HSD17B6 and hydroxysteroid compounds has an important effect on steroid activity as these compounds typically act in a stereo-specificity manner (1). 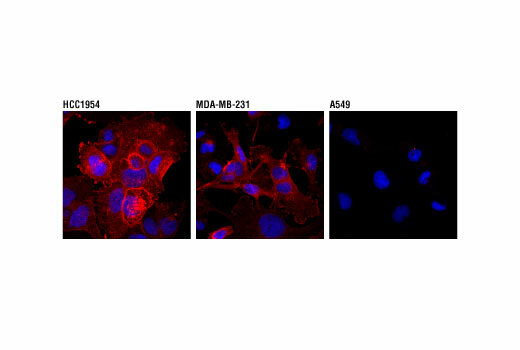 Research studies show that the transcriptional activity of androgen receptor in prostate cell lines treated by androstanediol correlates with HSD17B6 protein level, which suggests an important role for enzyme in prostate cancer growth (2).